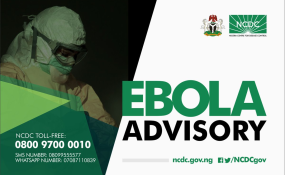 Following confirmation of an outbreak of #Ebola in #Congo, the Nigeria Centre for Disease Control issued a public health advisory. Kampala — Ministry of Health yesterday confirmed the Ebola scare at the Uganda-DR Congo border after receiving information that at least 257 people had died of the haemorrhagic fever by Saturday. "This is about 100km from our border but of recent there have been more challenging and scaring cases. We got cases 50km from our border. From the Ntoroko side of the border directly on the landing site at Lake Albert," Dr Mwebesa said. He added: "Those become very critical and scaring to us because those are very close contacts because we keep our people there for business. Some of them have relatives there, some even have farms. And because of that direct contact with the people, it becomes very difficult for us." At least 80,000 people crossing to Uganda through the Mpondwe border and other crossing points in Kasese District are screened weekly. "Our system is very prepared. That is not accidental or luck that we don't have a case yet when you hear of those many numbers near our border. It is because of a very vigilant system from Kisoro to Nebbi. But a case can cross from our porous borders. Not everybody passes on the official border points," Dr Mwebesa said.